A courier came to our house yesterday. A really big square packet, almost 1.5 feet long both sides. Then I remembered my brother mentioning about sending me something special. I thought it might be some baking books or tools or something in those lines. My curiosity turned to a horror and I ran away from the packet. It was a weighing machine!!! And the husband is giving me glares. He look says that I should be on a diet of water and dry bread. 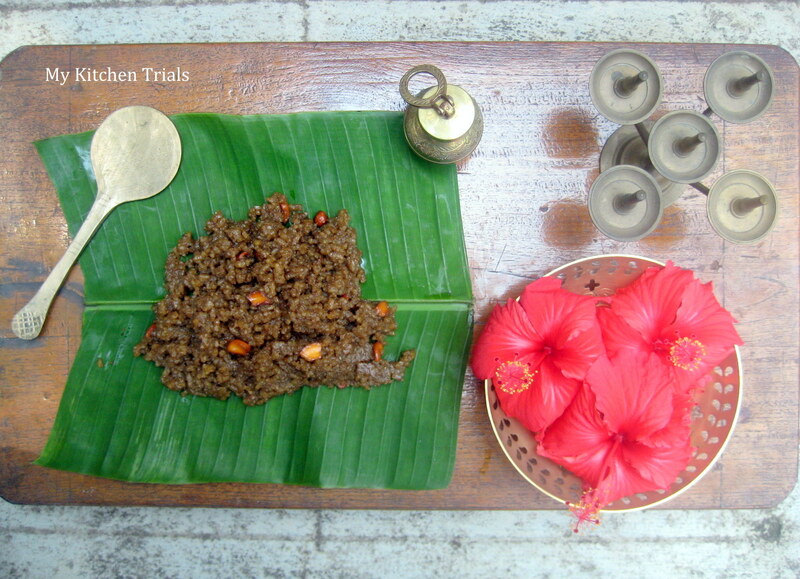 And as if all that is not enough, I am posting a recipe that is full of ghee. This is my periamma’s recipe and I kept on pestering her until she made this for me one day. The amount of ghee as well as jaggery can be reduced by almost half, but she said it tastes best this way. This week’s BM theme is Traditional recipes, and this one fits the bill perfectly. Go on and check out what others are preparing this week @ the Blogging Marathon page. Cashews, raisins : 2 tbsp. Pressure cook cleaned rice for 4-5 whistles or until done. It should be slightly over cooked, not too much though. 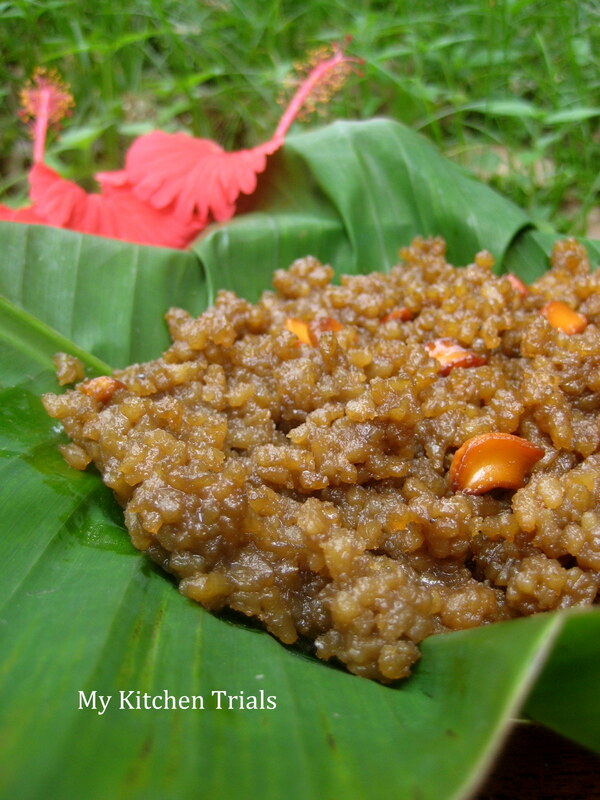 Melt jaggery in about 1/4 cup water in a big thick bottom pan, preferably a uruli. Once its melted, filter to remove impurities. Bring it to a boil and once it reaches the paagu state, add the cooked rice to it. To check whether the paagu state is reached, you can put a drop of the jaggery, that is boiling, to a cup of water. If it forms a ball that doesn’t melt fast, but yet is not too hard, its of the correct consistency. When the water is almost gone, you can add 1/2 cup more of ghee and the cardamom powder. Roast the coconut pieces, cashews and raisins in the remaining 1/4 cup of ghee. Tip this to the payasam and take off the heat. Note: The amount of ghee and jaggery can be reduced, if you feel like. My mother uses almost half of what is mentioned here. Hilarious rajani, I can imagine the horror on your face. S is so cute, he is saying you won right. 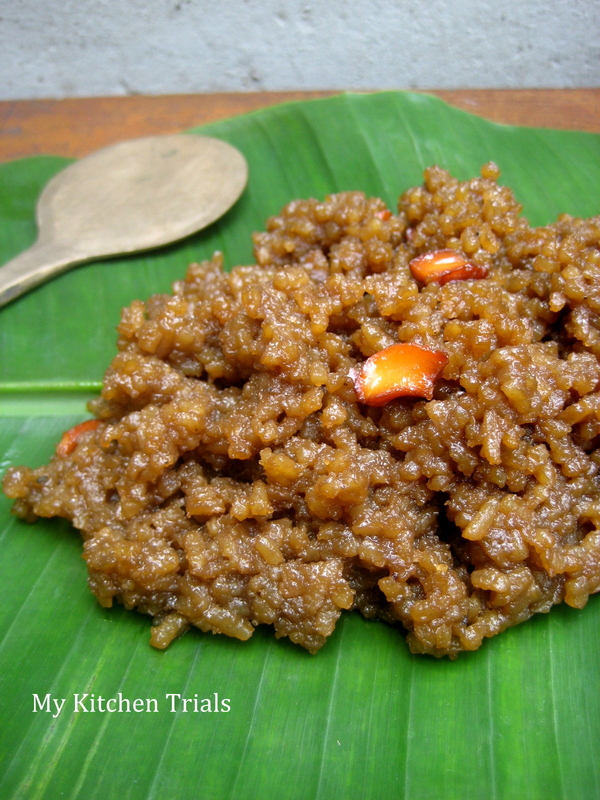 so be happy hheheheh..:) sakara pongal has the right amount of glaze to take us to heaven. Must have tasted yum! well why are we talking about weight…I had put away my weighing scale, but with this viral ………………removed it back..lost a few kgs…but the minute I feel better I know it will shoot up!..love the sinful dessert. I like what your periamma says, the more the tastier! lolz, soo funny you are Rajani..am still laughing here..I hate my weighing machine to the core. Very authentic sharkara payasam,inviting. This is absolutely sinful!! Love the shine on the pongal! love this authentic and delicious payasam!!! feels more festive with the serving on a plantain leaf!!! For this reason I haven’t changed the battery in my weighing machine. Hope the glaze is due to the ghee. I was indeed puzzled by the title and was expecting to see a sugar kheer. Bless my ignorance. :) It looks divine and we just call it pongali in telugu.